Of course, the Hamptons like to think that they have the worst summer highway gridlock in America, but I can assure you that the Maine Coast, with its charming little one-street villages, built for the traffic of another era, gives the glitzy Long Island resorts some ozone burning competition, with insanely large SUV’s spewing fumes while moving at 15mph. A car in a line that dares attempt a left turn can back up fifty cars behind it. In the summer, no sane resident of Maine goes near Route 1 in the mid-coast region with special attention given to avoiding the otherwise charming stretch through downtown Wiscasset, the traffic clogger to beat all others along Maine’s 3, 478 miles of coastline. We locals know the scenic shortcuts but don’t think we’re going to tell any of you Flatlanders where they are. 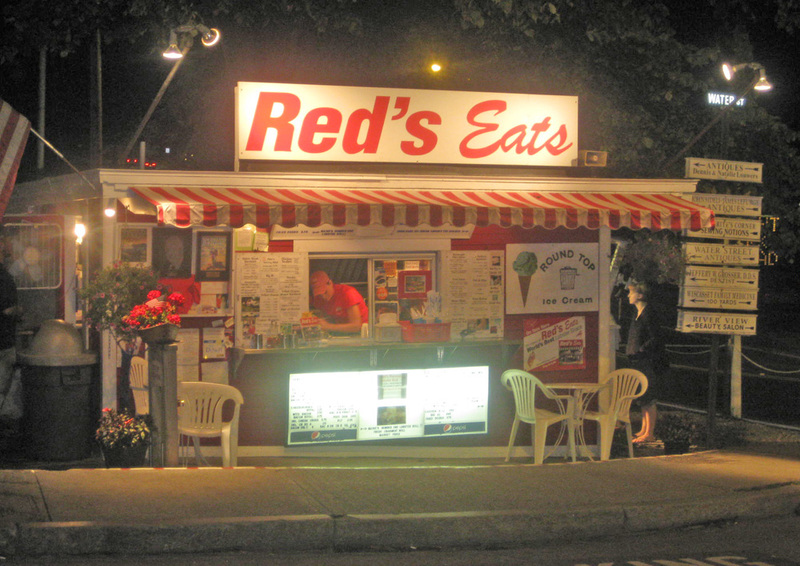 One of the chief causes of these backups of giant out of state SUVs is the legendary lobster roll palace, ‘Red’s Eats’ at the edge of town. Lines of 50-100 can be found at almost any hour of day, waiting for the famous road food. 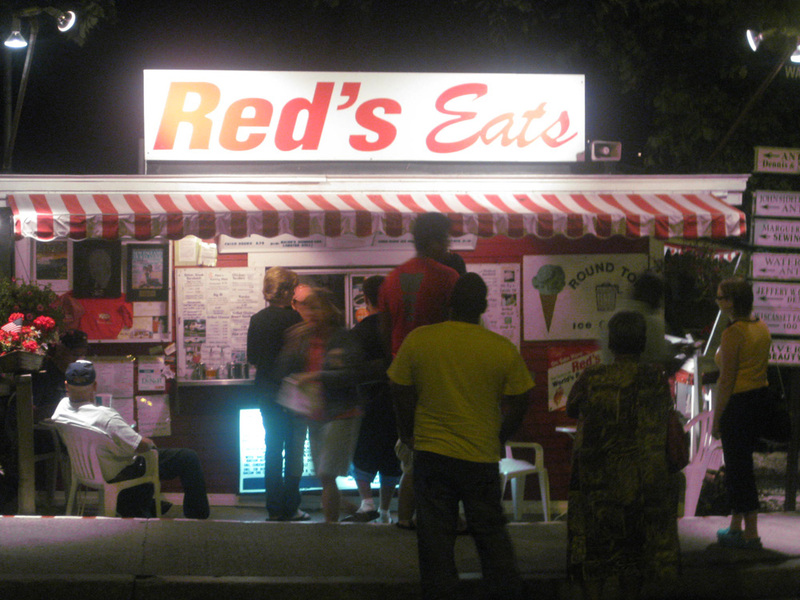 7:52 PM, Red’s Eats, as tourists never see it. No line, no waiting. And the most cheerful staff imaginable. On the Friday evening before Labor Day, with the peak tourist season gone, and the crowds lessened, I decided to brave the highway home from Bath, rather than up to Augusta on the interstate or a trip through the winding backroads at twilight, and here, at 7:30, is the scene of calm that I found, unthinkable just a week before. 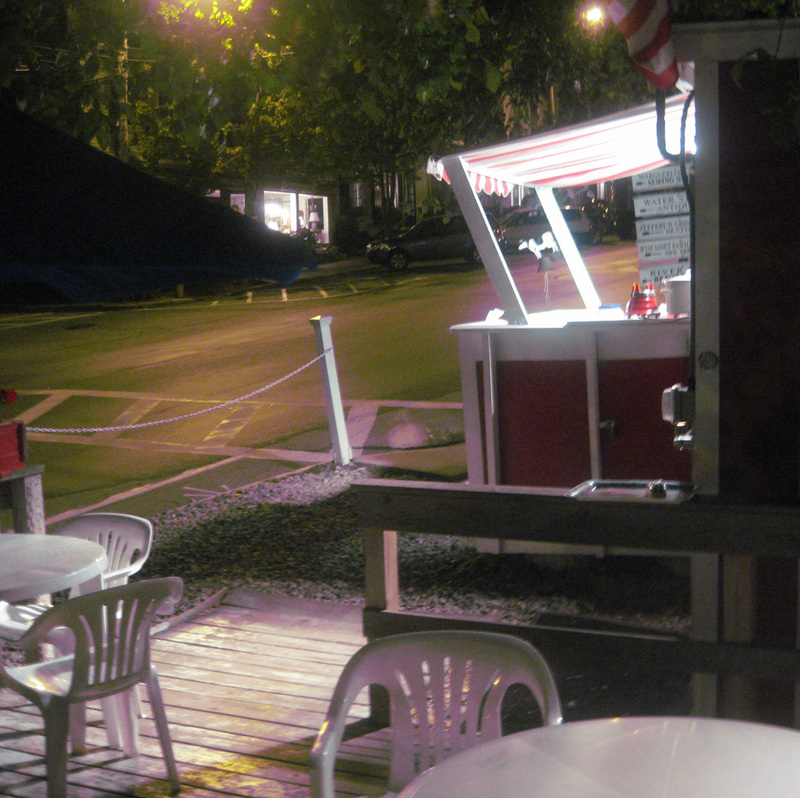 8:20 PM….the outside deck of Red’s, looking to a traffic free Main Street, for the first time in nearly 3 months. The peace was broken only by the unruly children of clueless parents at the next table. For all those who have inquired, I am happy to quote Mark Twain—the reports of my death are greatly exaggerated. Another eating post to follow, and then we’re back to houses and gardens…so many unfinished posts, so little time. You are making me hungry for things I can't even get down here in the flatlands. I've never experienced the Maine summer traffic face to face, but being a coastal Rhode Islander I feel your pain. Just the other day I was this close to throwing my car into a ravine. Now TDALD (the day after labor day) almost nary an annoying SUV in sight!I'm glad your consumption's passed, that was close! 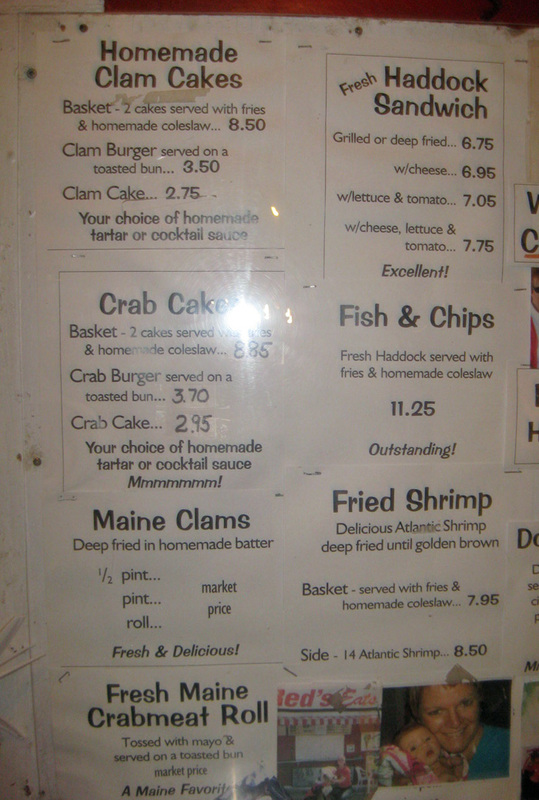 I'm going to take your word for it – I'm not a big seafood fan.And YAY for TDED still walking among us! Amusing to read that the Hamptons' traffic snarls should be something to which to aspire!The fish shop sounds excellent. TDED –You're so lucky to live in a part of the world where Ben's Chili Bowl wouldn't pass for a national treasure. Red's looks pretty idyllic on a good day. I'm going to make it to Maine sooner or later. God, what I wouldn't give for a crab roll right now. You are right about the traffic…it's why I can't/won't come home!